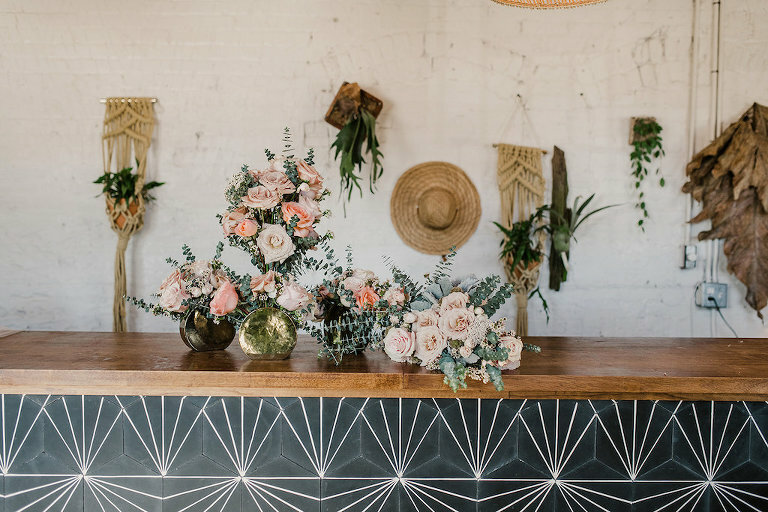 Alice and Zhiqiu’s intimate Tampa Bay elopement took place in a non-traditional wedding venue, a Tampa Heights plant nursery. 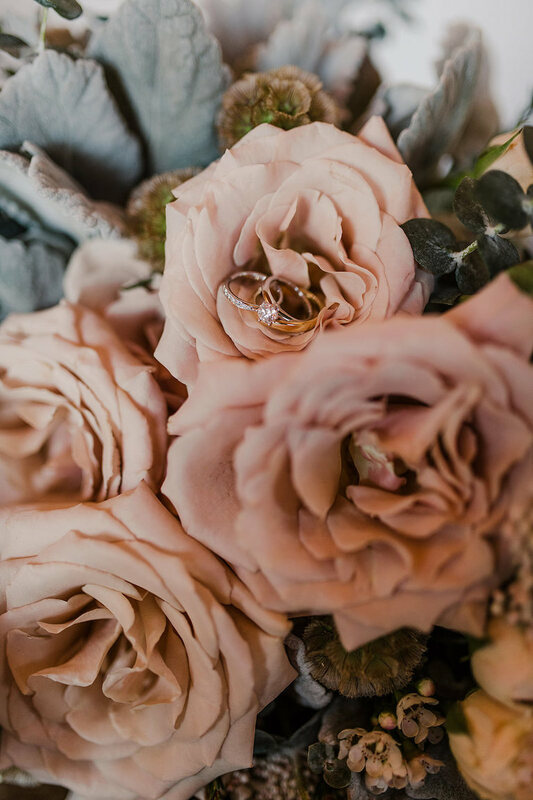 The bride and groom’s simple, yet stunning elopement focused on their love for one another and not all of the fuss that goes into a traditional wedding. 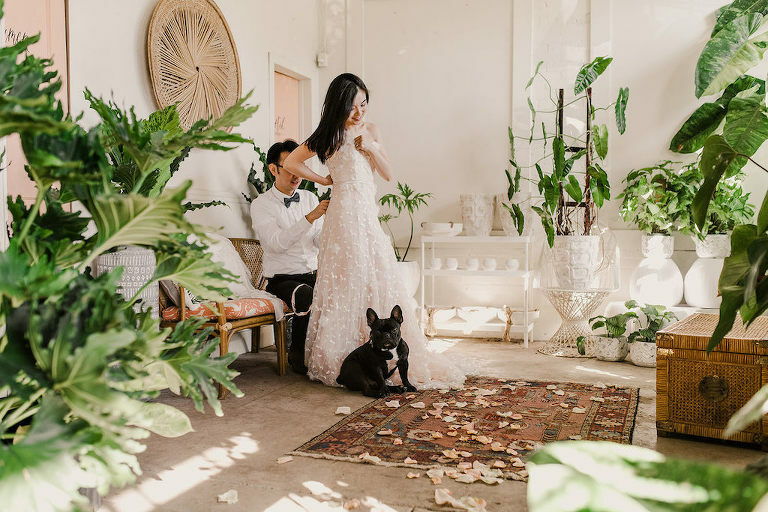 Aside from the beautiful eucalyptus and creamy roses, we can’t help but adore how the couple incorporated their sense of style and a four-legged witness, their Tampa wedding photographer’s French Bulldog! “I am an animal addicted, so we incorporated our photographer’s Frenchie with us. He showed up in most of our photos, and as our witness,” the bride shared. Although she didn’t know about Marry Me Tampa Bay prior to her wedding, Alice said she wished she would have used during her own planning. “I wasn’t aware of Marry Me Tampa Bay at the time of planning our wedding, but I wish I could have learned about it earlier, as it’s awesome! With the selections from the editors, it’s more efficient to locate the high quality vendors than other websites. The blog of real weddings is especially helpful with the photos and vendor information. I would suggest it to all of my friends!” Alice gushed. Looking back, the the bride reminisced on what her wedding day meant to her. “ZQ and I been together for eight years and experienced countless difficulties due to being long distance. The moment we exchanged our vows and rings meant a lot to us, and it marked the milestone for our relationship,” Alice shared. I am kind of shy and not good at talking in front of people. So the elopement is perfect for me. I am also animal addicted, so we incorporated our photographer’s Frenchie with us. He showed up in most of our photos. I love plants and nature. They always provide me with the sense of vitality, and they are fuel of my soul. The plants are the best decorations in my room, so I wanted my wedding to incorporate some greenery elements. Green and peach colors. They are the colors of the nursery and my wedding dress. They worked so well together and made my wedding dreamy and creamy. We got engaged on the peak of the Mountain LeConte. It was our first destination of traveling when we just arrived United States five years ago. We decided to revisit it to mark the first milestone of our relationship. It was quite challenging to hike for seven hours, and we almost gave up for several times, but we encouraged each other and finally climbed to the top! ZQ proposed at the edge of the peak, which so scary that I couldn’t move a step at all! We were lucky to meet a couple there and they recorded our big moment for us.